Journal of the House of Commons: Volume 2, 1640-1643. Originally published by His Majesty's Stationery Office, London, 1802. SIR Tho. Widdrington, Mr. Glyn, Mr. Whistler, Sir John Hotham, Mr. Bellasis, Sir Arth. Ingram, are to retire presently into the Committee-chamber, to prepare an Order concerning the Court at Yorke, under the Limitations that have been here mentioned upon the Debate. Ordered, That Mr. Blaney, now in the Serjeants Custody by a former Order of this House, shall be for the present bailed: And that if no Man shall bring in a Complaint against him within this Week, Sir John Price first having Notice of this Order, that then he shall be discharged of any farther Restraint. Ordered, That Mr. Gifferd, and Walter Coleman, apprehended for Priests, and in the Custody of the Keeper of the New Prison, be turned over to the Keeper of the King's-bench, to be kept there in safe Custody, and proceeded against according to the Law. Resolved, upon the Question, that the Order of the 11th of Nov. for making Stay of the Suit depending between the Tenants of the Manor of Butley in the County of Somersett, and Tho. Symcotts Esquire, be vacated; in regard that the House grounded that Order upon a Misinformation. Ordered, That the Committee for Seignior Amerigo be revived; and do meet To-morrow at Seven of Clock, in the inner Court of Wards: And Mr. Whittacre is added to this Committee. Resolved, upon the Question, That the House shall presently proceed to the Reading of the Declaration. The Proceedings against and Nominating of the Sheriffs, be taken into farther Consideration in the Declaration. Upon the Petition of Sir Wm. Acton, Sir Tho. Crymes Knights, Arhur Samuell Esquire, and other the Creditors of Sir Tho. Dawes Knight, who did heretofore advance about Twenty thousand Pounds to the Use of the Commonwealth, besides other Sums to the Use of his Majesty; and thereupon, by an Order of the House, were to have an Act of Parliament, to make all his Lands, and other his Estate, and other the Lands of Sir Abraham Dawes his is Father, liable to the Payment of those Monies so advanced in the First Place; their own just Debts, in the Second Place; and, in the last Place, all other the Creditors of the said Tho. Dawes: This House being informed of several Suits, commenced in the Courts of King's Bench, Chancery, and Exchequer, by divers Creditors, and one Michael Fawkes, who refused to advance Monies, and presseth for Judgment, Publication, and Decrees thereupon; and so to put themselves in the First Place, contrary to the Intent and Order of this House: This House doth therefore think fit, and order, that the Judges of the several Courts be made acquainted therewith; and be enjoined to forbear all Proceedings against Sir Tho. Dawes, and his Estate, until this House have convenient Time to pass the Bill, according unto their former Engagements; the more great and weighty Affairs, both of this Kingdom and of Ireland, taking up the chiefest Part of their Time for the present. And it is the farther Pleasure of the House, that the said Creditors, and the said Fawkes, who prosecute the said Suits be made acquainted herewith, and forbear all Prosecution against the said Sir Tho. Dawes, until this House shall take farther Order. The House considered of their Order in reading the Declaration; which was, that the Declaration should be read Clause by Clause, and that every Member should then speak to each Clause, if he would; and if any speak to have the Clause amended, and that the House gave Leave to have it amended: Then it was amended; and the Clause, with the Amendments, put to the Question: And it was desired that it might be ordered, that the same might be still observed. An Addition of suppressing the Innovations; and extinguishing the Monuments of Idolatry.- An Addition-Of reforming the Universities. Resolved, upon the Question, That the Examination of this Party, that offers a Discovery to this House of some Matters that concern the Peace of the Kingdom, and Safety of some Members of both Houses of Parliament, shall be referred to a particular Committee. Resolved, upon the Question, that the Examination of this Party, now informed of unto this House, be referred to the Committee of Seven. The Examination of Mr. Waddsworth is referred likewise unto this Committee, concerning Two Priests, as is informed, apprehended by him. To desire their Lordships, that this House may have the Perusal of the Depositions, lately taken by their Lordships in the Presence of a Committee of this House, concerning the last Design to bring up the Army hither. That a Message be sent to the Lords, to acquaint them, that this House has been informed of some Matters, that concern the Peace of the Kingdom, and Safety of some Members of both Houses of Parliament, by one Tho. Beale; who was first examined by a select Committee, appointed for that Purpose; and then brought into the House; and there he made a Narrative of the same Matters, with this Caution, that he should not name the Persons publickly. Sir John Hotham brings Answer, that their Lordships will send Answer by Messengers of their own. Ordered, That the Serjeant do send to Mr. Waddsworth, and such others of the Persons employed by this House for the Apprehending of Priests, requiring them, forthwith to bring in the Names of so many of those Priests as they know. Ordered, That the Knights, Citizens, and Burgesses, of the several Counties of England and Wales, do consider of the Names of the prime Papists in their several Counties, and present a List of their Names to this House To-morrow Morning. 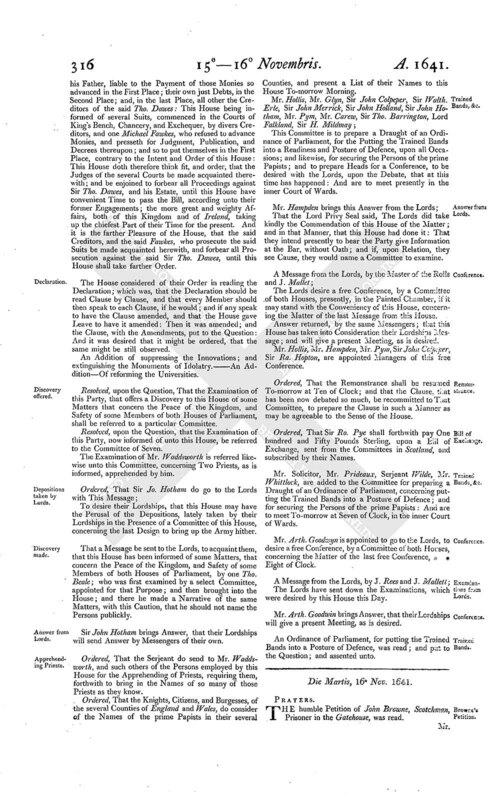 This Committee is to prepare a Draught of an Ordinance of Parliament, for the Putting the Trained Bands into a Readiness and Posture of Defence, upon all Occasions; and likewise, for securing the Persons of the prime Papists; and to prepare Heads for a Conference, to be desired with the Lords, upon the Debate, that at this time has happened: And are to meet presently in the inner Court of Wards. That the Lord Privy Seal said, The Lords did take kindly the Commendation of this House of the Matter; and in that Manner, that this House had done it: That they intend presently to hear the Party give Information at the Bar, without Oath; and if, upon Relation, they see Cause, they would name a Committee to examine. The Lords desire a free Conference, by a Committee of both Houses, presently, in the Painted Chamber, if it may stand with the Conveniency of this House, concerning the Matter of the last Message from this House. Answer returned, by the same Messengers; that this House has taken into Consideration their Lordships Message; and will give a present Meeting, as is desired. Mr. Hollis, Mr. Hampden, Mr. Pym, Sir John Colpeper, Sir Ra. Hopton, are appointed Managers of this free Conference. Ordered, That the Remonstrance shall be resumed To-morrow at Ten of Clock; and that the Clause, that has been now debated so much, be recommitted to That Committee, to prepare the Clause in such a Manner as may be agreeable to the Sense of the House. Ordered, That Sir Ro. Pye shall forthwith pay One hundred and Fifty Pounds Sterling, upon a Bill of Exchange, sent from the Committees in Scotland, and subscribed by their Names. Mr. 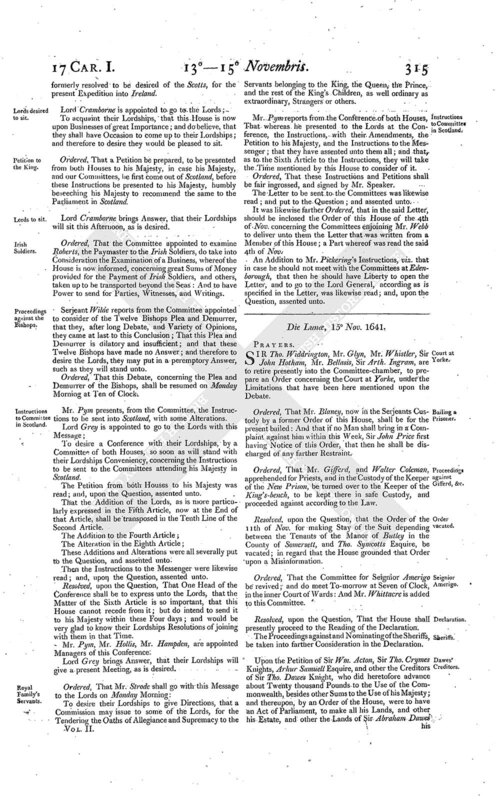 Solicitor, Mr. Prideaux, Serjeant Wilde, Mr. Whittlock, are added to the Committee for preparing a Draught of an Ordinance of Parliament, concerning putting the Trained Bands into a Posture of Defence; and for securing the Persons of the prime Papists: And are to meet To-morrow at Seven of Clock, in the inner Court of Wards. Mr. Arth. Goodwyn is appointed to go to the Lords, to desire a free Conference, by a Committee of both Houses, concerning the Matter of the last free Conference, * * Eight of Clock. The Lords have sent down the Examinations, which were desired by this House this Day. Mr. Arth. Goodwin brings Answer, that their Lordships will give a present Meeting, as is desired. An Ordinance of Parliament, for putting the Trained Bands into a Posture of Defence, was read; and put to the Question; and assented unto.